Yorba Linda homeowners and business owners can count on Patio Place for incredible deals on brand name patio furniture, bbq grills, fire pits, umbrellas, gas logs, and more. In business since 1989, we have helped thousands of customers find the right patio furniture at a great price. We are authorized dealers for some of the best-reviewed brands on the market and have the industry knowledge necessary to provide you with knowledgeable advice and trustworthy recommendations. We know how to select outdoor furniture that will balance any space, complement any architectural style or design aesthetic, and meet your goals while staying within budget. Additionally, as patio furniture experts, we also provide Yorba Linda customers with expert patio umbrella repairs; lasting outdoor furniture frame treatments; customized sling, pillow, and cushion replacements; and skilled barbecue parts replacement at very affordable prices. With unparalleled customer service, cost-saving repairs, same-day delivery, and value pricing, it's no wonder Patio Place is the preferred choice among thousands of Yorba Linda and Orange County customers. Visit today to learn more. With so many affordable options, you'll be sure to find the outdoor living furniture and accessories you need to complete your Yorba Linda patio, poolside, terrace, backyard, or other outdoor area at a price that fits your budget. Visit today. Visit us today for the best selection of wicker, extruded aluminum, and cast aluminum patio furniture from Alumont, Hanamint, and other leading manufacturers. 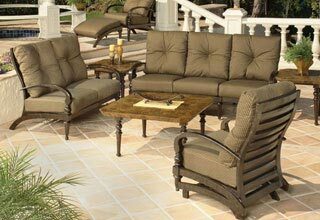 Attractive, durable, and typically warrantied for years against damage or defect, our inventory of quality patio furniture comes from the market's leading brands. We also accommodate special orders for custom-made patio furniture, and can exchange patio furniture frames and outdoor cushions according to your preference. We have solutions to fit every budget and decor, and will always provide you with reliable, trustworthy advice. We even offer same-day patio furniture delivery to Yorba Linda for the majority of our items. This service includes removal of old furniture, cleaning, and patio furniture set up. We only sell the market's finest fire pits, fire tables, and bar stools from top brands, such as Alumont and Hanamint. Affordably priced and well-built, our fire pits and fire tables will enhance your Yorba Linda home or business's outdoor spaces for years to come. Our specialists will help you to choose the perfect fire pit, in the right size, shape, and style for your decor, and help you complement your fire pit with reflective fire glass or attractive bar stools. Available in wicker, extruded aluminum, and cast aluminum styles, our bar stools can feature cushions, back rests, foot rests, arm rests, swivel components, and more. 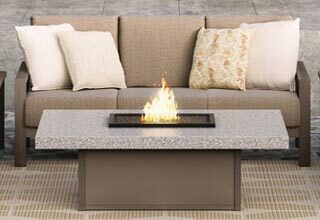 Stop in today and view our entire selection of fire pits, fire tables, and barstools for Yorba Linda. 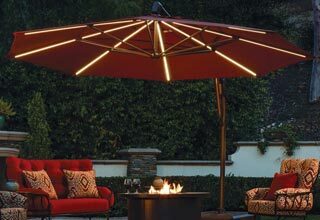 Yorba Linda customers can rely on us for the best deals on quality, brand name patio umbrellas, including easy track umbrellas, push to tilt umbrellas, side post umbrellas, auto tilt umbrellas, and cantilever umbrellas, from Galtech, NorthCape, and Treasure Garden. We also sell a wide variety of umbrella accessories, such as umbrella bases and lights, and can customize your umbrella with a monogram or business name or logo. For those who would rather repair rather than replace their patio umbrella, we offer impeccable recovering, restringing, and rib replacement services. Call today and learn more. For rock-bottom prices on Fire Magic barbecues and grills, as well as Real Fyre gas logs, visit Patio Place today. We sell, deliver, and install propane and gas barbecues anywhere in the Yorba Linda area and also provide gas line hook-up services. We also carry many of the most commonly requested BBQ parts and accessories, such as lights, warmers, range hoods, access doors, and more. For those interested in more of a centerpiece, we offer gorgeous gas logs in vented and unvented models, with fire glass, river rocks, and lava rocks. And, if you want to truly upgrade your outdoors entertaining space, consider buying a kegerator or expanding your cooking experience with an outdoor fridge, sink, or faucet. For a fair price, we'll drive out to your Yorba Linda property to provide our professional cleaning services. Our cleaning service includes thoroughly cleaning and vacuuming your patio furniture, washing outdoor cushions, and removing spiders, cobwebs, bird droppings, and other accumulated dirt. Once clean, we recommend keeping your patio furniture or barbecues looking spotless with standard and custom-made protective covers. Call us today for the finest umbrella recovers, replacement slings, and outdoor replacement cushions in Orange County. Yorba Linda customers can trust us to expertly restore their existing patio umbrellas and outdoor furniture to like-new condition as we use only the highest quality outdoor fabrics at all times, including those made by Sunbrella, Phifer, and original manufacturers (if available). Stylish, durable, and typically warrantied for years against damage, our outdoor fabrics deliver an excellent return on your investment. 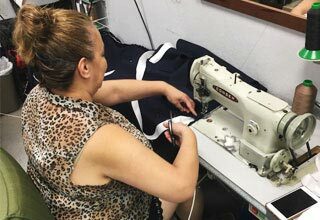 With over 600 fabrics to choose from, we have options for every style and budget, and can sew in zippers for easy cleaning and stitch in padding for added comfort. Available seven days a week, visit us today at our nearby showroom in Costa Mesa at 845 Baker St.